Earlier this year, my old faithful home server, “buster”, died. Buster was a hand-me-down 500 MHz Pentium III, and his role in my house was file server, print server, DHCP/DNS server, web server, router/firewall, VPN server and for a couple of years, a mail server. He also performed some odds and ends: turning on/off my Christmas tree lights via X10, emailing me every morning with birthday reminders, fetching RSS feeds, and processing updated geocache information into Palm and Lowrance GPS formats. In his last days, buster also filled a unique roll as a squid proxy, serving up an “upside down internet” on an open wireless network. It might have been this final task that drove him mad. His RAM was fried. I hastily replaced buster with a WRT54g router, on which I tried both the Tomato and dd-wrt alternative firmwares. Both of them did a terrific job. However, I still wanted a file server that could remain on 24 hours per day, one that I could store files on, and one that would share my printer. I also missed having a VPN. In short, I wanted a replacement for buster. However, what I did not want was a power-hungry box that made a lot of noise. I finally settled on a Fit PC 1.0 (not to be confused with their newer model, the Fit PC slim. The Fit PC 1.0 has about the same specs that buster had: 500 MHz Geode, 256 MB of RAM, USB 2.0 ports. But what it does not have is a hungry power appetite. It uses only 3-5 watts of power! And it is fanless and silent. 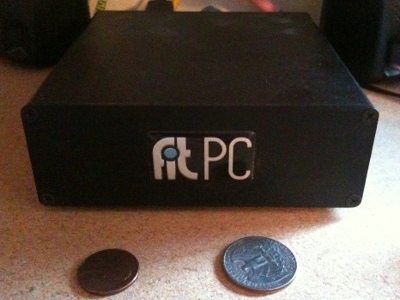 I call this new Fit PC mini-server “bender”, and I look forward to working together with him.